Party Supplies and Decorations for a truly Irish Celebration and great for a St. Patrick's Day Party or to show your support for the Irish Team either Soccer or Rugby. 'Happy St Patrick's Day' Multipack Flags - 26cm• Celebrate St. Patrick’s Day• ..
Our Orange Peel Candy Buffet Plastic Scoops are Ideal for Candy Buffet Sweet Treats, Wedding Favours.. Giant Green Plastic Bunting - 10m (each)Green giant plastic flag bunting. Length of bunting: 10m (32..
White Plastic Tablecover - 1.4m x 2.8m • Make your table party perfect• ..
Green Candy Stripe Paper Bags are Ideal for Candy Buffet Sweet Treats, Wedding Favours, Shop Counter..
Green Plastic Tablecover - 1.4m x 2.8m • Make your table party perfect• ..
• Make your table party perfect • Paper straws • Each measures 20cm • Pack of 10 ..
Green Tall Top HatOne size fits mostSoft fabricCelebrate St. Patrick's Day with the very Irish Party.. 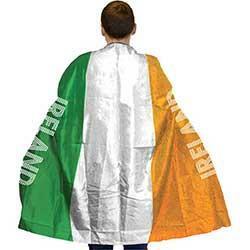 Happy St. Patrick's Day Large Horizontal Banner - 65" X 33 1/2"High quality productSt Patrick's Day ..
Ireland Flag Body CapeOne size fits all Show your support at sporting eventsFabric flag capeAdu..
Ireland Flag Fabric Bracelets - One size fits most ..